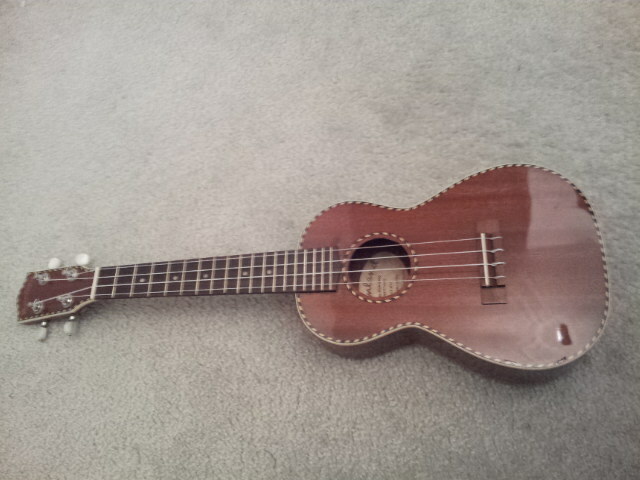 Exactly two months after beginning to learn ukulele, I finally got a quality instrument for myself, ordered online from Mainland Ukes in Indiana (yes, there are good ukuleles made outside of Hawaii). I first encountered Mainland because of an electric tenor that Linda lent me at my very first Steel City Ukuleles meeting. This instrument had some very nice qualities I appreciated: its construction, appearance, and sound. I delayed two months because I wanted to get sufficiently proficient that I could actually tell what was good and what I like. Also, Abby’s friend really wanted the banjolele back (I had been playing it mostly, amidst the other loaners), and having already signed up to perform in a gig soon (! ), I really wanted to have my own instrument for that. Why this Mainland Classic Mahogany Concert? After trying various instruments, I concluded that I really did want a solid wood ukulele, rather than a laminate, because of the fuller sound. Given that, there was the question of a reasonable price point. I figured that I did not want to spend more than $300 on an instrument. Another thing was that I wanted to make sure the intonation and action were decent, and were set up with care. That meant ruling out buying from some random store without a specific person responsible for setting up. I looked up a lot of reviews and descriptions online, and also demonstration videos. Hawaii Music Supply was much mentioned, for example. But I found information that made me think Mainland was the way to go. Comparing the woods, I liked the deep mahogany sound. Although the bright spruce-topped instruments sound great too, I prefer deep to bright, even if the classic ukulele sound is on the bright side. So I eventually contacted Mike of Mainland and asked him some questions, and then put in the order, and the instrument quickly arrived. I already love it! I felt I did a reasonable job in evaluating (in person or from online information) various instruments before finally ordering one. This was not an impulse purchase. Now that I have a beautiful instrument, I feel committed to play it every day! I expect to enjoy this investment for many, many years to come!